The Email Summary is an important tool to give you a pulse on your Events after they complete. They give you insight into the interaction on you Church Online Platform site and help you automatically see the the stats that are important to you. This is the name of the selected Event. The day and time that the Event happened. 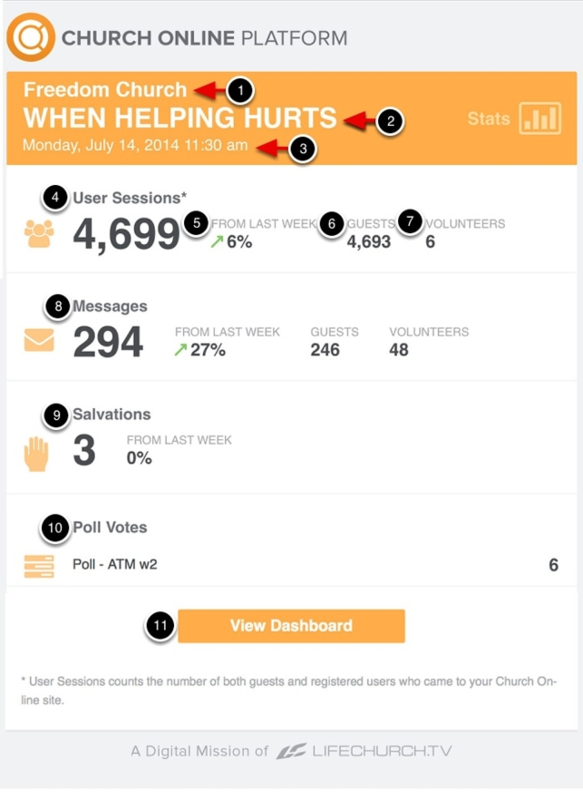 "User Sessions" count the number of both guests and registered users who came to your Church Online Site. This could vary from what you are seeing on Google Analytics or your streaming provider as different metrics are used to pull the data for their sites. 5. "From Last Week" is the comparison of this weeks data to last weeks data. A green arrow will show if there was growth compared to last week. A red arrow will show a decline since last week. "Guests" is the number of users that are not assigned roles in your Admin. It will show count them whether they login or not. "Volunteers" is the number of users that are assigned roles in your Admin. "Messages" is the number of exchanges in the Chat dialog. Every time a user sends a message, it is counted. "Salvations" is the number of users that clicked on a "Salvation" slide during the Event. You must create a "Salvation Slide" in the slides type editor in the Admin before it will appear here. "Poll Votes" is the number of polls that were selected during your Event. You must select a "Poll Slide" in the slides type editor in the Admin before it will appear here. "View Dashboard" will launch your Dashboard and take you to your Church Online site.